aFe Control is proud to release the PFADT Series Drag Rear Solid Spherical Control Arm Bearings Set for the 06-13 Corvette Z06 (C6). OE factory bushings are known to deflect more than a 0.25 inch in turns which equates to almost 1 degree of lost camber and unpredictable handling and loss of traction. Serious racers finally have an engineered solution for solid spherical control arm bearings. The elimination of bushing deflection improves traction and improves 60 foot times. 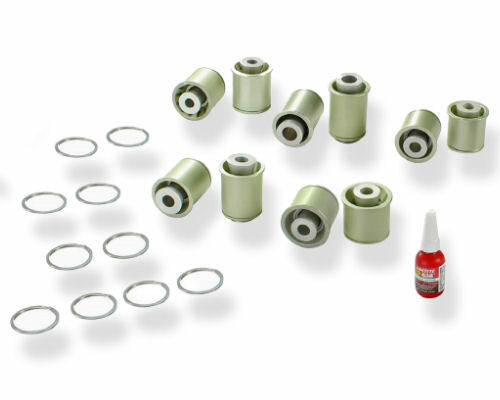 The aFe Control kit replaces all 10 rear control arm bushings with mono-ball, spherical joints to eliminate friction and deflection. This high quality kit features 6061-T6 aluminum bearing housings which feature a special, Mil Spec high corrosion resistant anodizing, CNC machined heat treated 17-4 PH stainless steel shafts, and CNC machined 6061-T6 articulation spacers. The replaceable bearings are Teflon lined for minimum friction, zero maintenance and are manufactured by FK bearing in the USA. This kit is designed to maximize the performance of your race car suspension. Due to the nature of this race part there is an increase in road noise, therefore we do not recommend this for the casual street car and is highly recommended for dedicated track cars. Not recommended for the casual street car.